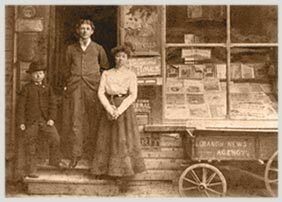 The Etter Family has been in the business of distributing the written word since 1913. That’s when Samuel Etter opened his first newspaper stand in Palmyra, Pennsylvania. He sold newspapers, candy and tobacco to the general public. In 1931, Samuel became a wholesaler for out of town newspapers by purchasing some trucks and a distribution warehouse that doubled as a retail store. Around 1940, the Etters branched into the magazine distribution business. Until the mid 70s, the business was known as the Lebanon Valley News Co. It wasn’t until 1975 that they acquired the larger Harrisburg News Agency and later merged the organizations. As the magazine industry consolidated rapidly in the mid 90s, Harrisburg News grew their business with major chain retailers and expanded their footprint in Pennsylvania and beyond. Today, Harrisburg News Company distributes magazine, book, and newspapers throughout central Pennsylvania and parts of Maryland, New Jersey, New York, and Virginia.